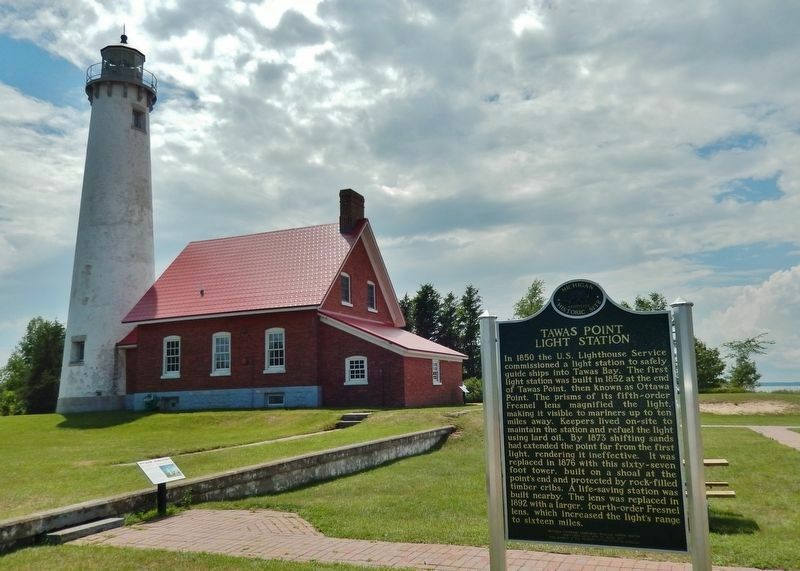 In 1850 the U.S. Lighthouse Service commissioned a light station to safely guide ships into Tawas Bay. 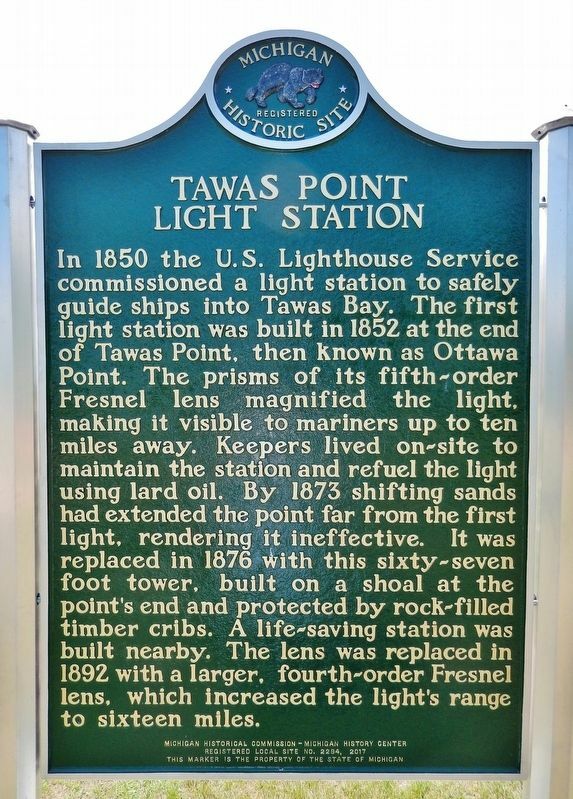 The first light station was built in 1852 at the end of Tawas Point, then known as Ottawa Point. The prisms of its fifth-order Fresnel lens magnified the light, making it visible to mariners up to ten miles away. Keepers lived on-site to maintain the station and refuel the light using lard oil. By 1873 shifting sands had extended the point far from the first light, rendering it ineffective. It was replaced in 1876 with this sixty-seven foot tower, built on a shoal at the point’s end and protected by rock-filled timber cribs. A life-saving station was built nearby. The lens was replaced in 1892 with a larger, fourth-order Fresnel lens, which increased the light’s range to sixteen miles. Light Station to provide more staff housing. It was demolished in 2002. The light station was electrified in 1935 and turned over to the U.S. Coast Guard four years later. The Coast Guard, which automated the light in 1953, remained on-site until 1993. The light station was listed in the National Register of Historic Places in 1984. The state acquired the light in 2016 and replaced it with a modern optic further out on the point. Location. 44° 15.24′ N, 83° 26.958′ W. Marker is in East Tawas, Michigan, in Iosco County. Marker can be reached from Tawas Beach Road 3½ miles east of U.S. 23. Touch for map. 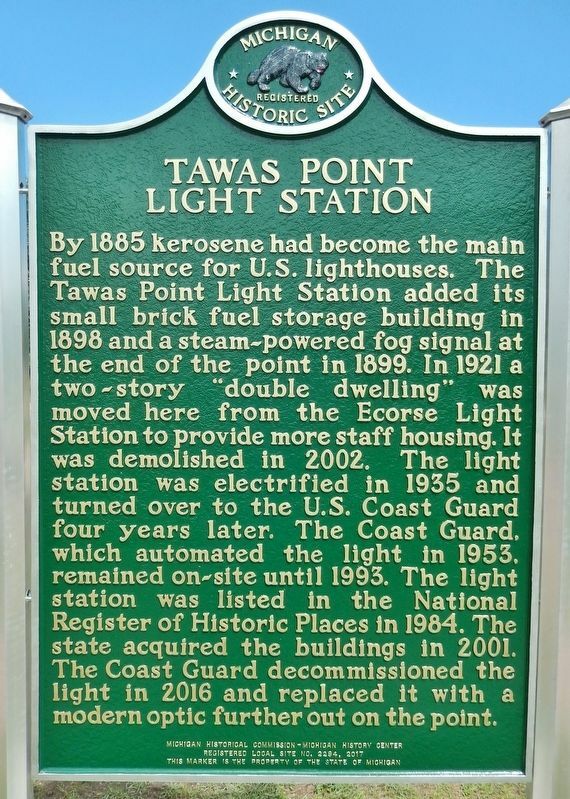 Marker is located inside Tawas Point State Park, at the end of Tawas Beach Road, in the grassy area northeast of the lighthouse. Marker is at or near this postal address: 686 Tawas Beach Road, East Tawas MI 48730, United States of America. Touch for directions. marker); A New Light on the Horizon (a few steps from this marker); Preserving the Light (a few steps from this marker); The Changing Shape of Tawas Point (within shouting distance of this marker); Tawas Lighthouse (within shouting distance of this marker); Oil House (within shouting distance of this marker); Konotin-Iosco (approx. 3½ miles away); Alabaster (approx. 6.8 miles away). 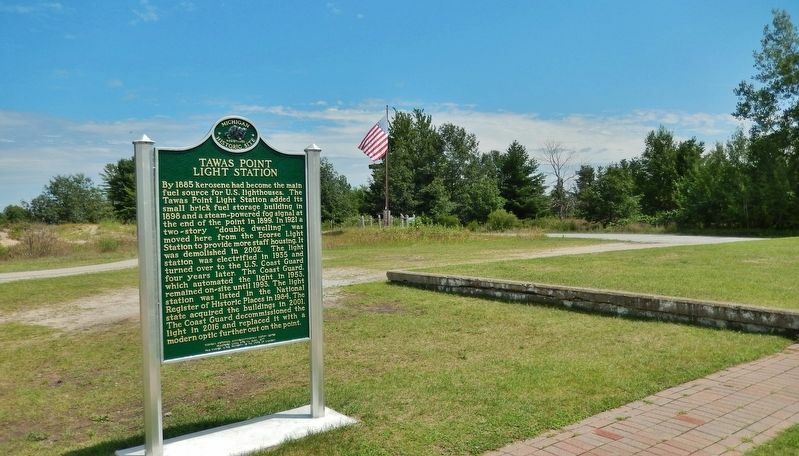 Touch for a list and map of all markers in East Tawas. More about this marker. This is a double-sided marker, with the same title but a different inscription on each side. More. 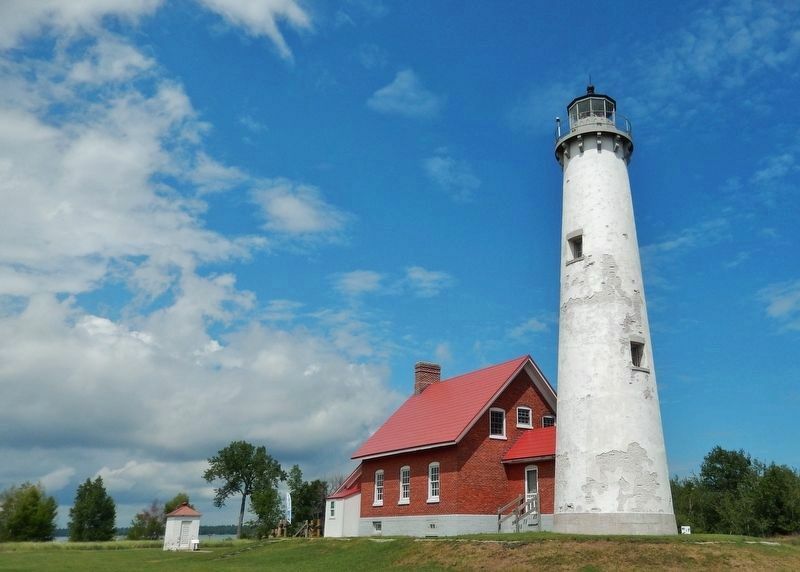 Search the internet for Tawas Point Light Station. Credits. This page was last revised on October 2, 2018. This page originally submitted on July 24, 2018, by Cosmos Mariner of Cape Canaveral, Florida. This page has been viewed 139 times since then and 15 times this year. Last updated on October 1, 2018, by Cosmos Mariner of Cape Canaveral, Florida. Photos: 1. submitted on July 24, 2018, by Cosmos Mariner of Cape Canaveral, Florida. 2, 3, 4, 5, 6. submitted on July 25, 2018, by Cosmos Mariner of Cape Canaveral, Florida. • Andrew Ruppenstein was the editor who published this page.